Peruse his detailed series on vSphere 6.5. Emad Younis and Paul Braren in the VVOL area at VMware Partner Exchange 2015. Or, you can have a listen to him talking all about VCSA. Emad clearly has a bit of fun on this particularly enjoyable podcast, where you're sure to learn a lot about the many technical benefits of moving to VCSA, and how to migrate over without loosing anything. I can safely say that in my home lab adventures with VCSA since the early 5.5 days, things have only gotten better! but don't forget to also subscribe on iTunes or Soundcloud. Sitting near the back at a recent Orlando VMUG during the kick-off keynote, suddenly a tap on the shoulder. There's Brian, smiling, despite having just come in from a red-eye flight. We agreed that Orlando Airport is a strange place to be without ones kids. Later that day, somebody was talking to me about the SuperServer demo I had just done, and the conversation wandered over to VCSA and backup. Of course, I then introduced him to Brian, who had just written an excellent article about that very topic! Just one of those many little magic moments that only happen, in person, face to face. We later had a lively talk with a bunch of folks about Veeam installs on Windows versus NAKIVO in a preconfigured OVA. In the afternoon, Brian flew off to Boston for the next VMUG USERCON, on the very next day! But wait, there's more! You should also check out Brian Graf's recent appearance as well, you'll thank me later! So there you go, IT Pro, perfect entertainment to enjoy during your holiday travels! My experience at the Boston VMUG USERCON Dec 8 2015, amazing speakers and 12 home lab giveaways! 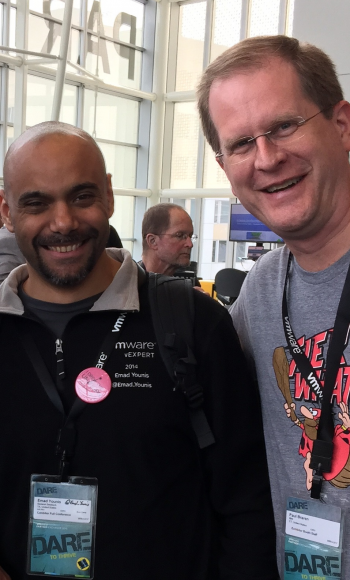 Brian's PowerCLI blog at VMware Blogs. 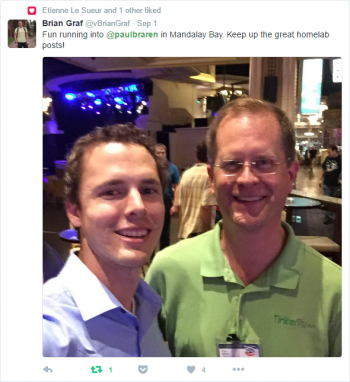 Brian Graf is a Senior Product Manager - Distributed Resource Management (DRS/HA/DPM) at VMware. Previous to Product Management, Brian worked as a Senior Technical Marketing Manager at VMware, focused on PowerCLI Automation and ESXi Lifecycle technologies. Previous roles also include: Consultant for EMC Consulting. His main focus was Data center migration methodologies and implementations. Emad's posts at VMware Blogs. Emad Younis is a Senior Technical Marketing Engineer working in the Cloud Platform Business Unit at VMware. He currently focuses on vCenter Server Appliance and vCenter Migrations. Previous to VMware he worked as a virtualization architect designing and implementing large enterprise vSphere environments both as a customer and partner. Yep, that's the same Emad!